185-189 Great Western Road, Glasgow. G4 9EB. Munro Motors occupied this site in the early 1960s. The pub is now known as the Captains Rest. It was also known as the Baracuda Bar. 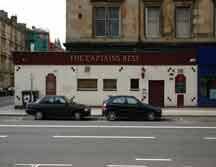 Alfie Conn Celtic fame once owned this pub. Tang of the sea at the Captains' Rest. 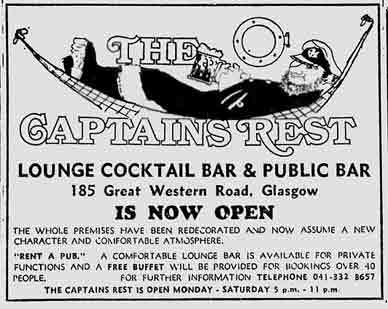 Owner of the new Captain's Rest at 185 Great Western Road just over the flyover from Glasgow's city centre is 32 years old Desmond Roy Le Marquand. The man from a seafaring family in Jersey puts a very great accent on boats, ships, and all floating crafts. The former Barracuda Bar has as many ships' instruments in brass decorating the bar and lounges. One of Le Marquand's gimmicks is even to have his female staff wear sailor jerseys with a steering-wheel emblem. There are literally hundreds of pictures of all kinds of shipping, and there's even a genuine ship's bell to help clear the pub at closing time. Within the next few days the Captain's Rest will have a real steering wheel in the gantry of the public bar. Le Marquand seeks all the time something new to attract the customers but what better than to have his spirits on sale at 28p for a fifth of a gill. The Captain's Rest also has a lounge bar and a cocktail bar, both of which give you the impression that it's time to shove off for foreign parts. The new boss realises he has staff opposition in the area but is already well holding his own. He makes this offer to parties of 40 and over- as well as the best of service there is a FREE buffet. The Captain's Rest has a sea-type communication which links one bar to another through the "blower" system. There aim is to make the Captain's Rest a sanctuary for the customers. He says: "We want to create a friendly, relaxed atmosphere with something to look at. After all the customers are entitled to it." The Captain's Rest is a place to visit. But don't get seasick.